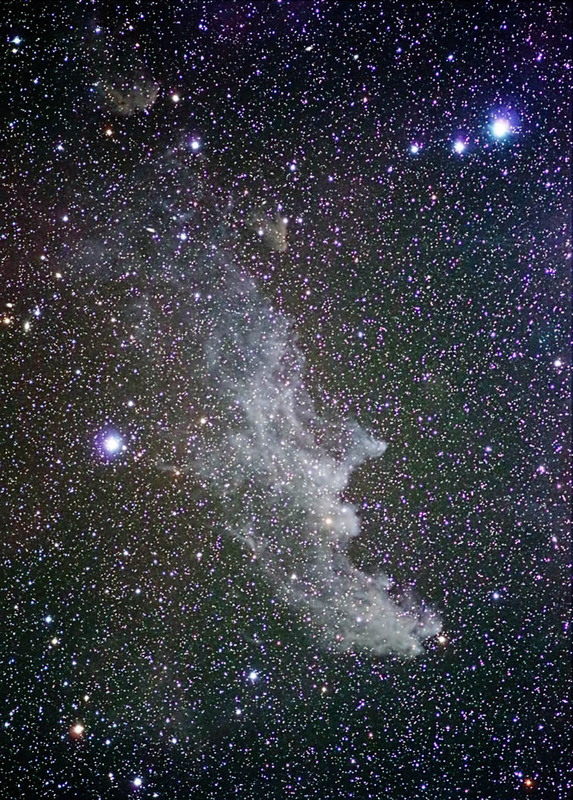 IC 2118 is a reflection nebula that is comonly known as the Witch Head Nebula due to its resemblance to a classic fairy tale crone. It lies approximately 800 light years away in the constellation of Eridanus. It spans 70 light years and is illuminated by the nearby blue supergiant star - Rigel. IC 2118 is believed to be an ancient supernova remnant that is currently in the process of forming new stars. Exposures: 14 @ 5 min. Note: Images were converted using Canon ZoomBrowser EX. They were then reduced,aligned and combined in ImagesPlus. The composite image was adjusted in Photoshop. Topaz Detail and DeNoise were then applied.